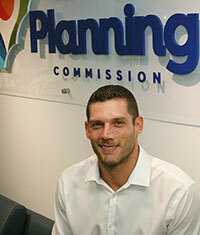 The Planning Commission welcomed a new employee in September: Design Planner Albert Park. Albert began working for the agency on Sept. 25. In addition to assisting the graphics specialists with graphics related tasks, Albert will help in the evaluation of Act 247 land development proposals, assist in development of comprehensive plan planning concepts and illustrations, and help planners with stormwater, landscaping, site layout, and urban design issues they encounter. He will be using various tools to help with his daily tasks, including Adobe Creative Suite, SketchUp, and AutoCAD. Albert previously worked as landscape designer for a landscape architecture and land planning firm in King of Prussia that specializes in commercial and residential sites. While pursuing his bachelor’s degree in landscape architecture at Temple University, Albert interned at a small design-build landscape architecture firm. While at Temple, he also helped design and construct an award-winning exhibit at the Philadelphia Flower Show and studied at an architectural design studio in Rome, Italy for a semester. “I’m looking forward to using my background in landscape architecture while assisting the Planning Commission with various projects and initiatives,” he said. Prior to Temple, he managed his family’s Dairy Queen in Springfield, Delaware County and was a certified personal trainer. Albert resides in the Woodlyn section of Ridley Township, Delaware County.